(CNN) -- World number one Tiger Woods will play at next week's WGC-CA Championship in Florida, the PGA Tour have announced. Woods will continue his comeback following knee surgery in the CA Championship in Florida. Woods resumed his career last week after an eight-month lay-off following reconstructive knee surgery, reaching the second round of the WGC-Accenture Match Play Championship in Arizona. The American was knocked out by South Africa's Tim Clark and would not specify when or where he would play next. The 33-year-old had until 11pm CET to confirm his appearance at next week's tournament at Doral near Miami, Florida, and the PGA Tour issued a press release ahead of schedule that Woods will be in the 77-man field. 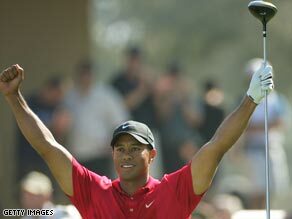 "We can confirm that Tiger Woods has committed to the CA Championship," the PGA Tour release stated.